Earn 40.5 PDUs for $229. Watch The Agile PrepCast. The Agile PrepCast is a complete PMI Agile Certified Practitioner (PMI-ACP)® exam prep course that also qualifies for 40+ PDUs for your renewal. Earn PDUs anytime, anywhere - on your phone, tablet or PC. Just press play. The Agile PrepCast is a complete PMI Agile Certified Practitioner (PMI-ACP)® exam prep course that also qualifies for 40+ PDUs toward your renewal. Earn PDUs anytime, anywhere - on your phone, tablet or PC. Just press play. Earn PDUs by watching video-based training and learn the latest agile principles, methods, and approaches. All PDUs are Pre-Approved. The Agile PrepCast is listed in the Continuing Certification Requirements System (CCRS) and has been pre-approved by the Project Management Insitute (PMI)® to offer 40.5 PDUs. Aligned with the PMI Talent Triangle®. The course was specifically reviewed to meet the requirements outlined in the CCRS Handbook and match talent triangle requirements. Counts Toward Your Minimums. 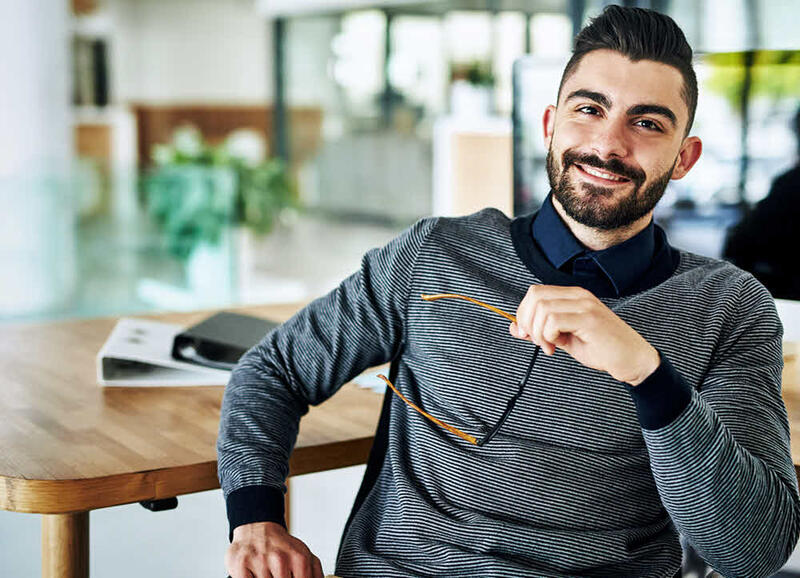 PMI® requires that you earn as many 8 PDUs in the areas of Technical, Leadership as well as Strategic & Business management for your certification renewal. The Agile PrepCast doesn't fully cover these minimums, but the PDUs you earn count toward the minimums. Download All Lessons to Your Phone or Tablet. As a modern project manager, you are always on the go and need to be able to use every available minute to earn your PDUs. That's not a problem because The Agile PrepCast is a full-featured podcast: Just install a podcast app on your phone and then download every single video lesson right into your pocket! Ironclad 90-Day Money-Back Guarantee. We’re so convinced The Agile PrepCast is the most practical and effective way of its kind to earn your PDUs that it comes with an ironclad guarantee. 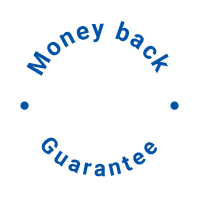 If you’re not 100% satisfied for any reason whatsoever we will gladly provide you with a prompt and courteous refund – no questions asked. Certificate for 40.5 PDUs. After completing the course material, you’re eligible to take our Final Exam. Once you pass the quiz, you’ll receive a Certificate for 40.5 PDUs to complete your renewal cycle. Easily Submit Your PDUs Online simply by claiming the total number of 40.5 pre-approved PDUs. It takes just two minutes. Automatically qualifies as Contact Hours for your PMI-ACP Exam! Are you considering getting PMI-ACP certified? Then you are in luck! The Agile PrepCast not only gives you 40+ PDUs, but also qualifies for 21 PMI-ACP Contact Hours. It doesn't get more Agile than this! As a PMI certified project manager you need to earn a specific number of Professional Development Units (PDUs) every 3 years for your certification renewal. For example, as a certified Project Management Professional (PMP)® you need 60 PDUs and as a PMI Risk Management Professional (PMI-RMP)® you need 30. By watching The Agile PrepCast you can earn 40.5 of them at once. To earn your PDUs you must first watch all the video lessons of The Agile PrepCast. Either downloading all lessons to your phone or tablet using a podcast app or by watching them online in your browser. We have a list of recommended lessons to watch specifically for those earning PDUs. Once you have watched all the lessons - but at the earliest two weeks after your purchase - you can take the Final Exam and then print your certificate. Taking and passing this exam is a PMI-required step. Log in to your online account in the PMI Continuing Certification Requirements System (CCRS) and claim all 40.5 PDUs at once. The Agile PrepCast is already listed in the CCRS and your PDUs are pre-approved! 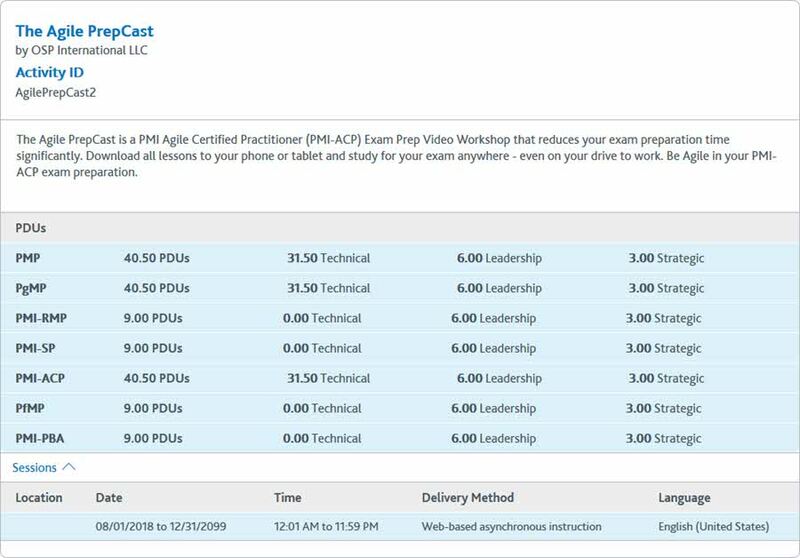 So all you have to do is watch The Agile PrepCast, pass the "Final Exam" and receive your PDU certificate, with which you can now claim 40.5 PDUs on the PMI website. Yes... It's really that simple. The Agile PrepCast is 40.5 hours in duration and costs $229. The cost per hour of training is therefore just $5.66. That's hard to beat! PMI's online Continuing Certification Requirements System is the official book of records for all pre-approved courses and tracking of your PDUs. The Agile PrepCast has already been submitted and is pre-approved. If you hold multiple PMI certifications then the PDU values are automatically applied to ALL your certifications! The Agile PrepCast is a PMI-ACP Exam preparation course that PMI credential holders can use to earn PDUs. You will receive 40.5 hours of in-depth training based on agile principles, methods, and approaches. You will learn about the latest concepts, tools, techniques, skills, and knowledge. Each module contains anywhere from 3-10 lessons that cover the 40.5 hours of training you need in order to earn 40.5 PDUs. Get Your 40+ Pre-Approved PDUs In One Place. The Agile PrepCast is 100% aligned with the PMI Talent Triangle®. When you claim your PDUs on the PMI CCRS website you will automatically receive the total of 40.5 PDUs. In addition, the PDUs are correctly mapped and will reflect as PDUs for the three sides of the talent triangle as follows: 31.50 Technical PDUs, 6.0 Leadership PDUs and 3.0 Strategic and Business PDUs. The Agile PrepCast falls under the Education category. This is defined as "Learning opportunities that allow you to expand and enhance your technical, leadership, or strategic and business management skills." We cover all three! The Agile PrepCast delivers self-paced learning conducted online and through varied forms of digital media. This category of activity is specifically listed as approved in PMI's CCRS Handbook. This is the bulk of the training you receive. It is defined as "Knowledge, skills, and behaviors related to specific domains of Project, Program and Portfolio Management". In total, you receive 31.5 PDUs in this Talent Triangle skill area, which covers the required minimum of 8. You need up to 8 hours of training / PDUs covering leadership topics and The Agile PrepCast covers 6 of these. It provide training in knowledge, skills, and behaviors specific to leadership-oriented, cross-cutting activities that help an organization achieve its business goals. You receive 3.0 PDUs of knowledge and expertise in the industry or organization that enhances performance and better delivers business outcomes. Just as with the other skill areas, the required minimum is up to 8 PDUs. Almost 2,000 (!) project managers have submitted The Agile PrepCast to earn their PDUs! Once you sign up, you’ll immediately have access to the 100+ instructional video lessons. You'll have the option of either accessing the lessons online or use a free podcast app to download them to your phone. The course covers the majority of your PDU needs, at the best price, and with the best guarantee. And it doubles up as your PMI-ACP Exam Preparation course, too! This is as risk-free as an offer can come. In fact, the ONLY risk is that you might buy another PDU course that costs more at a lower quality. Earn 40.5 PDUs. The Agile PrepCast was designed following PMI®'s quality requirements for Registered Education Providers and qualifies for 40.5 pre-approved PDUs. Learn About Agile. The Agile PrepCast is based on the most current PMI-ACP Exam Content Outline. Learn all the agile concepts that a PMI-ACP certified project practitioner needs from this course. Pay just $5.66 per Hour. It's one of the least expensive ways to cover your PDU needs. Press Play. Earn PDUs. What could be easier and more agile? All you have to do in order to earn your PDUs is to sit back, relax and press play on our training lessons. So... Are You Ready to just "Press Play" and Earn Your PDUs? Or you can confidently use The Agile PrepCast and start earning your PDUs simply by watching our in-depth lessons. easily start earning your next 40.5 PDUs for your certification renewal. P.S. If you are seeking to achieve simplicity in earning your PDUs, then this course will give you that simplicity. It will give you easy to watch and understand lessons to understand agile project management. It even goes beyond with several interview lessons on applied concepts. Enroll now and you'll have access to everything in just a few short minutes.